Roameo is the one missing fitness tracker for the physical inactive. Is roaming through the rooms like a maniac while being on the phone the only workout you get? Roameo will track your step count so you can share it with the world. Don't miss out anymore to tell your friends about your awesome sportiness! Roameo will detect incoming and outgoing phone calls and utilizes the phone's step count sensor to keep track of your walking around. 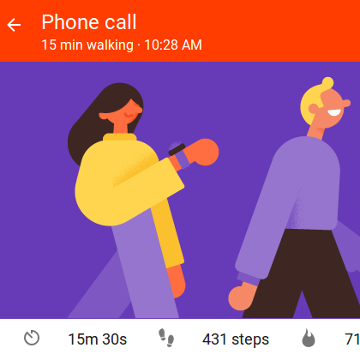 All call sessions are individually accessible for minute by minute step count break down and can be shared to social media and messaging apps on your phone - or optionally uploaded to Google Fit. 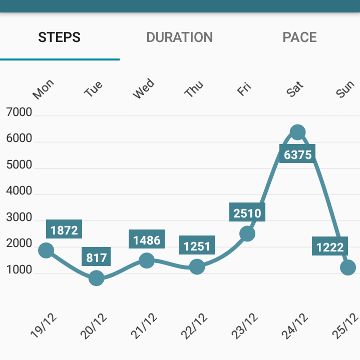 A weekly summary of all call sessions and the daily achieved step count, session duration and average pace (i.e. steps per minute) is graphically displayed for you. Collect step count, call duration and the resulting walking pace for each incoming and outgoing phone call. Get the number of walked steps for each minute during the phone call and see how they relate to the average walking pace. Inspect each week's summary of walked steps, call duration and the day's average pace. Take another look at each call session's details. Tell your friends about your most recent phone call workout by share its statistic summary in social media and messenger apps. Upload it to Google Fit along the way and make it an even more official training session!